Regulatory authorities have confirmed that Mr Ibbotson, from Crowle, North Lincolnshire, did not hold a "night rating" on his UK private pilot's licence, the BBC understands. His UK licence was mirrored by a US pilot's licence - enabling him to fly the US-registered Piper Malibu in Europe. The public record of his Federal Aviation Administration (FAA) licence states Mr Ibbotson "must have available glasses for near vision" and that "all limitations and restrictions on the United Kingdom pilot licence apply". But sources have told BBC Wales that Mr Ibbotson's licence restricted him to "flights by day only". An aviation source told BBC Wales that the ability to be able to differentiate between green and red lights is "key" to flying in the dark. "Anything that's on the UK licence applies to the US licence as well, so he couldn't do anything more than the UK licence allows. European aviation rules define night as "the time from half an hour after sunset until half an hour before sunrise". As the aircraft was US-registered, pilot and passenger must have a "common purpose" for making the journey, and the pilot must dictate when a flight leaves. The report adds that the flight "must not be made for the purpose of merely transporting the passenger". 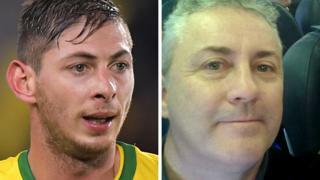 Sala's body was recovered from the wreckage of the plane in early February but Mr Ibbotson's body has not been found. In their preliminary report, the AAIB said that because Mr Ibbotson's pilot licence and log book had been lost in the crash, it had not yet been able to establish what ratings he held or how many hours he had flown recently - although it was known he had completed approximately 3,700 flying hours.